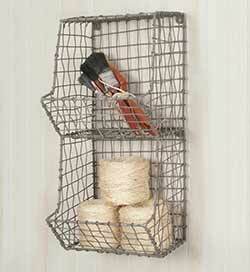 Perfect for rustic wall decor display or for organization. 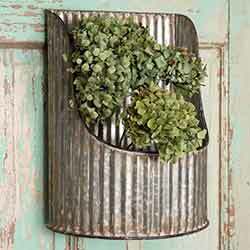 Made of gray corrugated metal with a distressed finish. 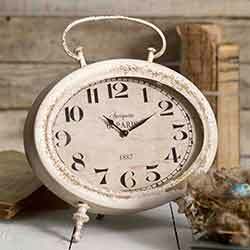 This tabletop clock features a beautifully distressed, chippy paint finish in white and robin's egg, perfect for that country cottage look! This style features a dandelion image, blowing into the wind with a wish! Sold in sets of 4. 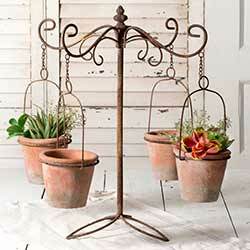 Set a unique and charming centerpiece indoors or out on the patio with this beautiful rustic metal plant caddy with elegant scroll designs, and four handmade terra cotta pots! 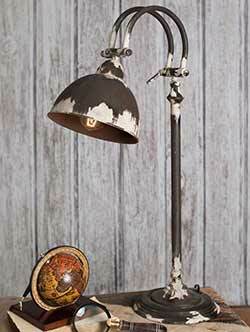 Perfect for your shabby chic office or craft room, this adjustable task lamp is both useful and pretty! 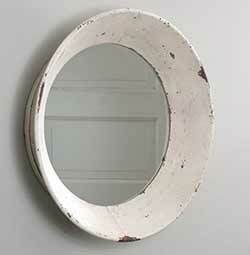 Made of metal with heavily distressed white finish for that beautiful chippy paint look. 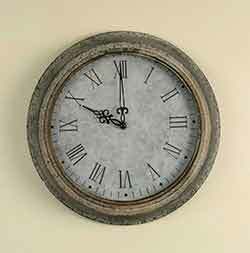 Features an oval shape and sitressed, antiqued finish and cream color. 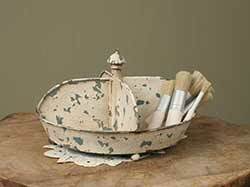 Organize your desk, bathroom, potting bench, or vanity in vintage style with this divided caddy. 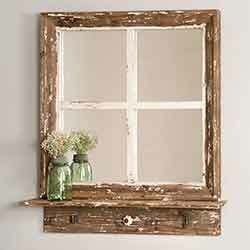 With it's deliciously chippy painted and rusty surface, it has a timeless shabby chic look! 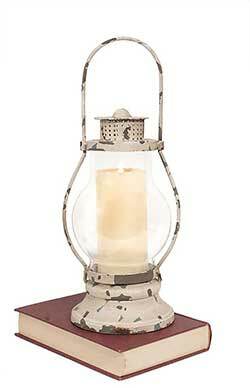 Add chippy vintage flare to your decor as well as mood lighting with this reproduction railway lantern! 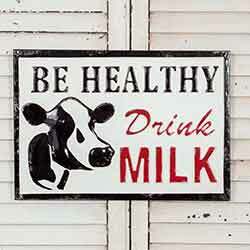 Set on a side table or hang on your porch. 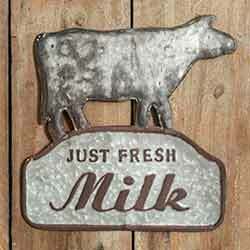 The star of any farmhouse kitchen, this vintage style dairy sign feature a cozy country cow. Made of embossed metal. 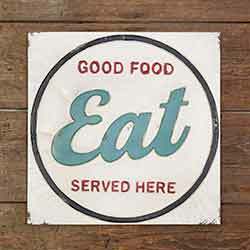 Reads: Good food served here. 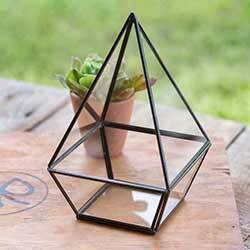 Add soft lighting to your outdoor patio, indoor side table, or hang for an event! Hangs or sits. Perfect for tossing in a larger bag when you're out in about. 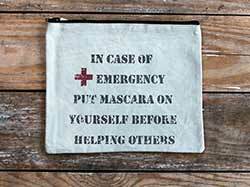 This one is gray with vintage military medic style lettering, and reads: "In case of emergency, put mascara on yourself before helping others." This padded pouch will keep your glasses safe and stylish! 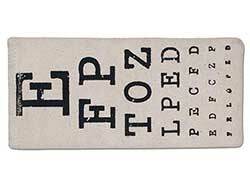 Features a vintage style medical eye exam chart. 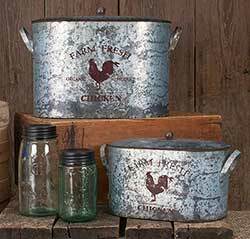 Use these farmhouse buckets for displaying towels or blankets, as planters, for laundry or craft room storage, or as decorative display! 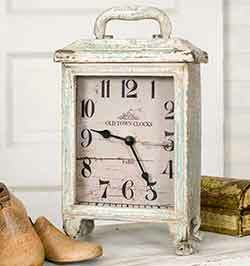 Made of distressed galvanized metal with a rooster image. This style features a vintage style advertisement for organic chicken, with rooster image, in a country red color. Sold in sets of 4. 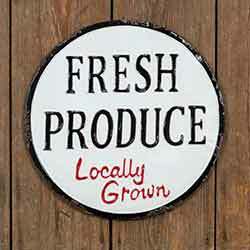 Made from distressed metal mason jar lid, these coasters read "farm fresh." Set of 4. 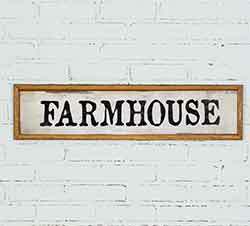 Ideal for any farmhouse country kitchen, this metal embossed sign is modelled after antique dairy signage. 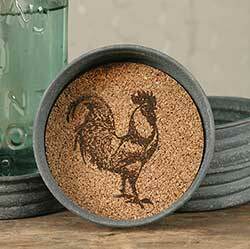 Made from distressed metal mason jar lid, the rooster image on these coasters lends a farmhouse chic touch to your home decor. 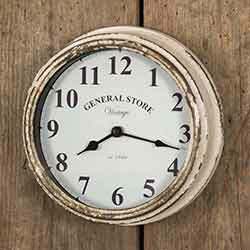 Makes a great gift for any flea market style decor lover! 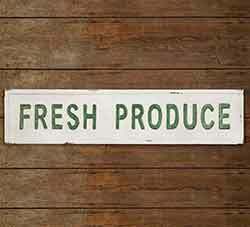 Framed distressed wood sign in a black and white color palette. Flat Dish Lamp, by Colonial Tin. We love to use these lamps to display candle wreaths or potpourri/rosehips. Make great entry way or night lights! 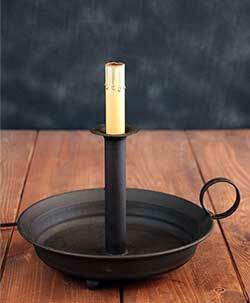 Dish is 11 inches in diameter (inside diameter is 8 inches); lamp stands 11 inches tall (without bulb). Has a matte brown/black finish. The lamp is electric - has a standard plug and cord, with a rolling on/off switch on the cord. Takes a bulb with a torpedo-style light bulb, such as a chandelier bulb or silicone-dipped bulb. Light bulb and candle ring in detail picture are not included. 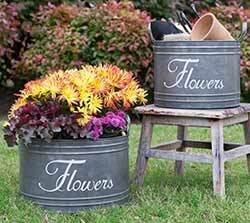 Use these oversized flower buckets for displaying florals, as planters, for laundry or craft room storage, or as decorative display! 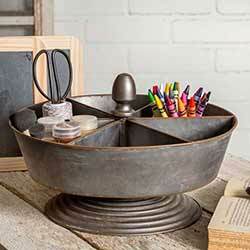 Made of distressed metal with "flowers" lettering. Use these oversized flower bins for displaying florals, as planters, for laundry or craft room storage, or as decorative display! 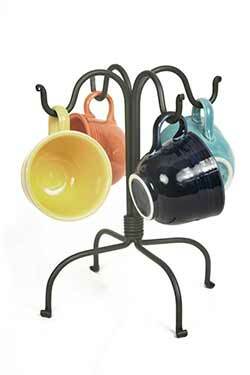 One of our longest-standing, best selling items, we absolutely love this mug rack! 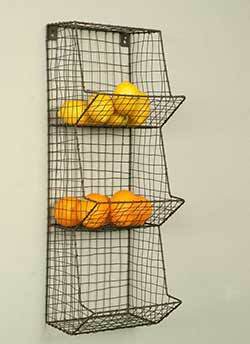 Made of sturdy wrought iron that stands up to the heaviest of mugs, it is tall enough to fit coffee mugs without touching the countertop, but short enough to fit underneath most kitchen cabinets. 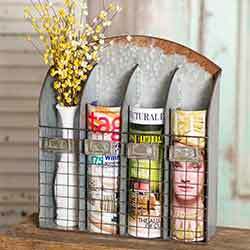 Made of galvanized metal with antiqued finish, perfect for florals, magazines, etc. 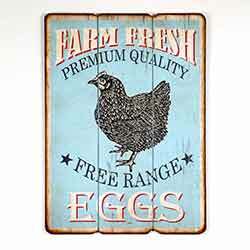 This large farmhouse kitchen sign features a distressed chicken and egg image, and reads: Farm fresh premium quality free range eggs. Made of embossed metal in a black, white, and red color palette. 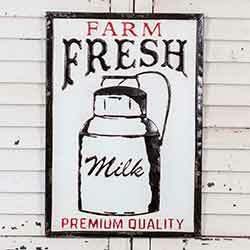 Vintage-look embossed metal sign. Hangs with two keyholes on the back. We love the welcome and inviting look of one of these lights perched in each window of a house, but they also are small enough to brighten a tight space in nook or on a shelf. 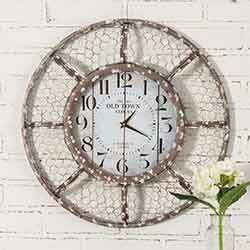 6 inch Friendship Window Light, by CTW Home Collection. 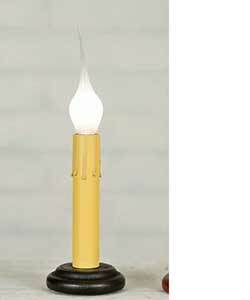 These small lamps have the look of a candlestick, especially when paired with one of our silicone dipped bulbs! Perfect for the kitchen, office, or craft room, attractive storage for art supplies, utensils, bathroom necessities and more! 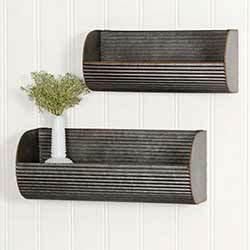 Just like an old general store bin, this triple wall caddy is perfect in your kitchen for produce, entryway for hats and gloves, the bathroom for towels and toiletries - so many possibilities!